You've probably seen those "This Is What a Feminist Looks Like" shirts popping up on so many British politicians and celebs. Now the charity responsible is firing back against accusations that they're being churned out of sweatshops. 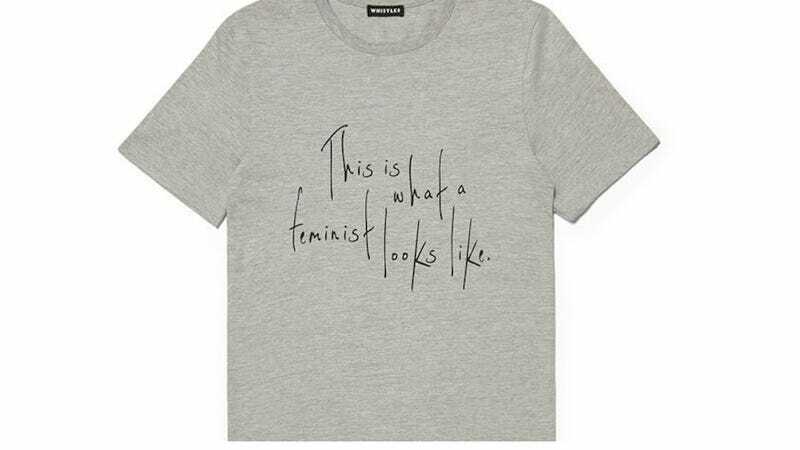 Eva Neitzert, deputy chief executive of the society, said: "The evidence we have seen categorically refutes the assertion that the 'This is what a feminist looks like' T-shirts produced by Whistles were made in a sweatshop. An audit into the CMT factory was carried out in October 2014 by an independent not-for-profit organisation and this did not reveal any material concerns on the working conditions, the welfare or the health and safety of workers." Even so, Neitzert promised they're working with an international organization to double-check the evidence, to make sure "all findings are robust and factual." Elle UK editor-in-chief Lorraine Candy, whose mag partnered with the Fawcett Society and Whistles on the project, echoed her statement: "We are confident that their production conforms to ethical standards." The Daily Mail stands by its story, according to the Huffington Post. Either way, it's a pretty great reminder that there are still big battles to fight, and t-shirts, no matter how cute or ethically sourced, remain limited in their effectiveness as a tool for change.